Realizing that disconnected silo-based efforts cannot effectively address these interrelated conditions on their own, innovators within the community development field have increasingly experimented with a different approach that speaks to linked community challenges. In this emerging approach, professionals from different but related community development sectors work together in a multi-sector coalition toward a common goal with an aim to holistically improve conditions for a group of people, neighborhood, or region. This approach is referred to as cross-sector community development, collective action, systems-level change, or collective impact, among other names. 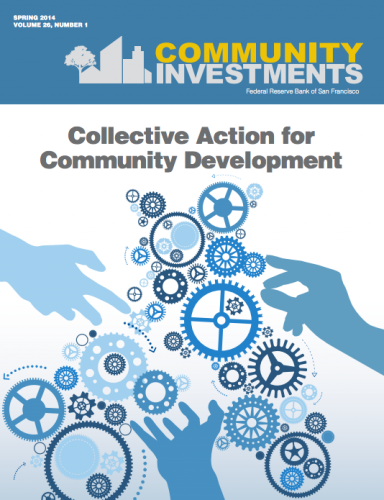 This issue of Community Investments explores this emerging approach and lifts up early learnings from pioneers in the field. The articles discuss how to establish and grow collective action leadership organizations and working groups and build a strong but flexible initiative framework; consider how government can be an effective partner in collective action work; and convey the critical role of data and measurement in these initiatives. We also examine some early examples of collective action initiatives in practice.